The Bhaktapur city is protected as a UNESCO world Heritage site. Bhaktapur, also known as Bhadgaon, it means city of the Devotees. It is the third major town of the valley and in many ways the most mediaeval. The Bhaktapur is on of the most charming architecture showpieces of the valley as it highlights the ancient. The main items of interest in the Bhaktapur are: The lion gate: Dating as far back as AD1696, this gate is guarded on either side by two huge statues of lions. A long side, there are two stone images of Gods. The Golden gate: The golden gate is said to be the most beautiful and richly moulded specimen of its kind in the entire world. The Golden is the mostly lovely piece of art in the whole Kingdom. The place fifty five windows : The place fifty five windows is the magnificent place was built during the region of King Yakshya malla1427 AD. Among the brick walls with their gracious setting and sculptural design is a considered to be a unique mabzer piece of wood carving. Nyatapola temple; The five- storey,30 meter- high Nyatopola temple is notly the highest temple in the whole Kathmandu valley, but also ano of the best example of Nepalese traditional architecture temple. The temple was built in 1702 AD and its design was so elegant and its construction well done. The art gallery: The art gallery contains ancient paintings belonging to the Hindu and Buddhist tradition of various periods description. The near of the Durbar square the statue of the Bhupandra malla. This statue showing King Bhupatandra malla in the act of worship is set one column facing the place. The square has many others statues, this is considered to be the most magnificent. 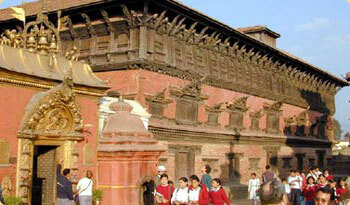 In Bhaktapur others more temples can be seen with a full of wonderful and magnificent arts and architecture. Bhaktapur’s people life style and them culture enchants you and enable to give you great experience in your life time. Bhaktapur also offers you such a glory woodcarving Handicrafts and colorful thangka paintings place. In Bhaktapur offers you many others interesting things which always able to difference experience than yours own. The main square of the city which used to be the capital part of old Bhadgaon kingdom contains numerous temples and monuments of wonderful nature. The first striking city mark would be the 55 Windowed Palace built by late King Vupatindra Malla with which the three remaining kingdoms of Kantipur, Lalitpur and Kirtipur envied a lot. This jealousy often lead to some political strife as well. During the Malla era Bhaktapur and Lalitpur particularly appeared as tough competitors. The 55 Windowed Palace is a unique type of structure, so it is the only kind in all modern Nepal without a single imitation or duplication or replica appearing elsewhere. The first ten windows decently face west, thirty-five face south and the remaining ten face east. The Golden Gate, the Gigantic Bell, the Stone Pillar of late Vupatindra Malla and the Chayslin Mandap (Octoganal Pagoda) look gorgeous. The National Art Gallery although closed on Tuesdays expose a large and detailed collection of marvelous stone-crafts and scroll-paintings. Entering through the Golden Gate and behind the 55 Windowed Palace, we come across Taleju Vawani Temple and the Royal Bath. Very obviously every city has a Taleju Vawani Temple as She is believed to be the Protectoress of the city by the orthodox Hindus. The Royal Bath yet looks glamoros with the image of the Serpent God in the middle of the sanatorium although the water-spout has completely dried up. Late King Ranjit Malla was the last of the Malla dynasty to take a holy bath. The 17th century also saw the downfall of the Malla monarchy. The Durbar Square is indeed a World Heritage Site. Adjacent to the Durbar Square is a famous market plaza called Toumadhi Square. This is a big junction where the chariot festival starts during the religious season. It is here that the striking landmark of the country stands tall and majestic. The Nyata-Poul Temple facing the cardinal direction of south is a Hindu pagoda, dedicated to Goddess Siddhi Luxmi. Built by late King Vupatindra Malla it is not only the tallest temple of the city, of the district, of the valley but of the entire nation. It is about 190 feet above the city’s ground level. According to the local language, “Nyata-Poul” signifies five-roofed. You can’t miss this from your aircraft window. Constructed out of pure terra-cota bricks and super-fine wooden materials, it owns a strong foundation. A dreadful earthquake shook Nepal in 1934. All the surrounding houses and minor shrines collapsed while this remained intact. To the right the Vairab Temple looks magnificent. It faces the cardinal direction of west and is a center for animal sacrifices. Further to the north-east of Toumadhi Square is another interesting locality caled Datta-Traya Square. In fact this is the second important urban spot of Bhadgaon. The Datta-Traya Temple also built by late King Vupatindra Malla in the 17th century is a famous pagoda carrying an amusing history. This is a wooden temple facing west; it is believed that the timber used for its relevant construction was sawed out of a single tree. So you can imagine how big the tree must have been. The square has been nomenclatured from the name of the Deity itself. The three-storied temple is dedicated to the three-headed Deity of the orthodox Hindus. It symbolizes the divine triad, a mere combination of Brahma (the Creator), Bishnu (the Preserver) and Maheshwor (the Destroyer). The square as a whole can be regarded as a marvelous gallery of intricate wood carvings. One can smell environments of medieval period around the square. In the periphery of the temple, you can also see monasteries, Vimsen Temple and a platform. There are a couple of handicraft quarters around where watching the skills of the carvers is a sheer joy. The Pujari-Math Temple has the renowned Peacock Window in the laneside facing the cardinal direction of east. It is a pure wooden structure, a master-piece indeed. Apart from these, there exist two special museums-the Metal Craft Museum and the Wood Craft Museum. This is the oldest Hindu temple of the Valley built atop a hill village called Changu. Dedicated to Lord Champak Narayan, it is declared to have been built by late King Hari Barma in 323 A.D. who also virtually belonged to the Lichhabi dynasty. The two-roofed pagoda temple is richly decorated with sculptures and carvings. To the ethnic Newars it is known as ‘Sako Changu.’ And the most authentic inscription located in the precinct of Champak Narayan is dated 464 A.D., accredited to King Man Deb.